On the walls of the RCVS are three memorials which pay tribute to members of the RCVS who lost their lives on active service. This ornate bronze tablet is inscribed with the names of the eleven Veterinary Officers and C.V.S. who died in the South African War. The memorial was commissioned in 1903 and presented to Council on 8th January 1904. 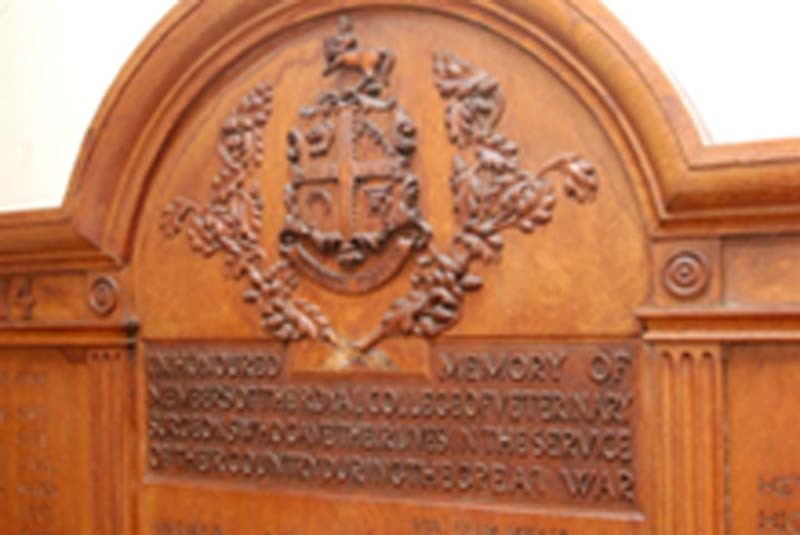 The RCVS Annual Report for 1919/1920 records Council’s decision to appeal for funds for a “memorial to commemorate the sacrifice made by members of the College … during the recent war.” It was hoped that donations would be generous enough to fund a memorial tablet and to provide a large endowment to the Library, in Red Lion Square. After an initially disappointing response the fund eventually grew to, £962 6s 3p, and a carved oak memorial tablet was unveiled on 7th April 1921 by Dr O.Charnock Bradley, then President of the RCVS. The tablet contains the names of the nine members who were killed in action, twenty four who died of wounds and thirty four who died from disease. The remainder of the funds were directed towards the RCVS Library which was renamed the “War Memorial Library” and moved to a larger room. For more information on the Memorial Fund see Boulton, Clare and McClary, Alison (2012) Royal College of Veterinary Surgeons’ War Memorial fund and library. Veterinary History, 16(2), pp. 169-181, which can be downloaded from the related documents box. [reproduced with permission of the Veterinary History Society]. This memorial was commissioned in 1948 to a similar design to the World War I memorial tablet and was funded solely by the College. Carved into the oak tablet are the names of the thirty eight members of the RCVS who died on active service. The memorial was unveiled on 6th February 1953. Information on the men listed on the war memorials can be downloaded from the ‘Related documents’ box.